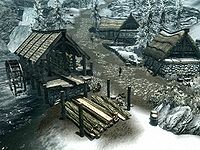 Anga's Mill is a small wood mill built along the north bank of the River Yorgrim, west of Windhelm. It consists of two houses and a sawmill. The mill is owned by Aeri, a Nord woman who inherited the sawmill from her father who died in the Great War. A short distance along the western road is the camp where Ennodius Papius lives. † Only during the quest Kill Ennodius Papius. The mill has two houses, Aeri's House just across from the saw mill structure and Anga's Mill Common House up the hill to the west. Outside the mill, chickens range freely. There are two wood chopping blocks and a grindstone. There are five barrels containing food and snowberries. You can buy sawn logsHF here after installing Hearthfire by speaking to Aeri. You can also cut your own for free if she has given permission to do so. Up the hill, two nests with chickens' eggs are outside the Common House. If you travel west a short distance down the road from the Mill, you will come across the tent that Ennodius Papius sleeps in during his related quest. Just west of his tent, behind the waterfall, is a barrel and an adept-locked chest containing leveled loot. One can be found along the bank of River Yorgrim. One lies across the river, opposite the mill. Two are located near Ennodius' camp; one to the south and the other to the west. One can be found just northwest of Aeri's house. Esta página foi modificada pela última vez à(s) 22h56min de 9 de janeiro de 2016.